Summary: Last year, Hannah's Christmas was full of love, happiness and romance. Things couldn't be more different this Christmas. Broken-hearted and lonely, Hannah wishes she could be happy and in love again but she is struggling to find even a glimmer of her old festive spirit. Luckily for her, there's some Christmas magic in the air . 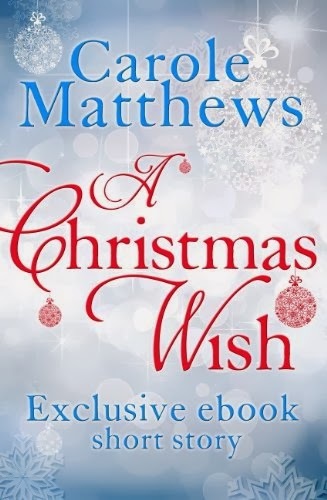 . .
A Christmas Wish is a heart-warming ebook exclusive short story that will make you a firm believer in the power of Christmas. So take twenty minutes for yourself and indulge yourself in this romantic and festive tale. Review: Now it's no secret that I am a fan of Carole Matthews. Not only does she write awesome novels. She has also written a fair few fantastic Christmas reads and Christmas shorts. This is the second Christmas short that I've read and I was not disappointed. Carole has a way with words and it's quite evident her love for Christmas. Hannah is an adorable character who I instantly fell in love with. Sadly, she met a man that ended up treating her badly and leaving her broken-hearted. In thinking and reminiscing about her lost love Hannah discovers that her lost love was not worth her tears. An awesome short tale that will have your heart in your mouth, now I really do hope Carole writes a longer read featuring the loveable Hannah and the dashing Connor again. A girl can only hope. This twenty minute wonder will have you reaching for more Carole Matthews novels TRUST ME!